Forklifts are used in many industries as a convenient tool to move materials. They enable workers to move heavy loads quickly and without the need to do so manually. While this can make a worker’s job easier and reduce the risk of a back or other injury from overexertion, forklifts can be dangerous not only to their operators but also to nearby workers. Workplace accidents involving forklifts can cause workers to suffer catastrophic injuries or wrongful death. 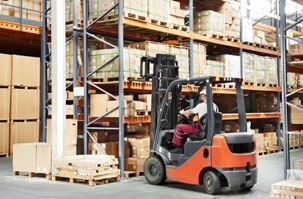 Fortunately, workers hurt in a forklift accident may be entitled to workers’ compensation benefits in Georgia and South Carolina. Forklifts are used in many industries, such as construction, factories, manufacturing, and retail businesses. Because of the danger, the Occupational Health and Safety Administration (OSHA) requires that forklift operators be at least 18 years old and complete an approved certification program before driving one. Employers are supposed to ensure that these operators are properly trained and that safety measures are followed. Unfortunately, this often does not happen, and preventable, tragic accidents occur. Forklifts are dangerous machinery. Workers who have not received the required certification or who are untrained can cause an injury accident if they are allowed to operate a forklift anyway. Forklift operators can engage in dangerous driving and operational practices, such as speeding, failing to properly position the forks, and failing to pay attention to other vehicles at intersections. Other tragic accidents can occur when operators drive off the loading dock or do not see nearby co-workers or shoppers in a retail business and hit them with the forklift. The truck driver and forklift operator must be certain that the truck trailer is immobilized before unloading or loading materials. When this is not done, the trucker can pull away from the dock when the forklift is still entering or exiting. Forklift operators should inspect their forklift at the beginning of their shifts to ensure that the forklift is in a safe operating condition. When unsafe forklifts are not taken out of operation for maintenance and repair, an accident can be the result. In some cases, defective forklift parts may cause or contribute to an accident. An injured worker may have a product liability claim against the manufacturer of the defective part as well as a workers’ compensation claim in this situation. When forklifts are not loaded properly or the driver does not navigate inclines safely, a forklift can tip over. The operator and nearby co-workers can suffer catastrophic injuries or death in a tip-over accident. When a forklift lacks seat belts, grab handles, or arm rests, the operator is at risk of being ejected from the forklift, which could result in a fatal accident. Failing to provide workers with proper safety equipment, such as hard hats, seat belts, and a roll cage to protect the operator in a rollover, can result in serious injuries or death in an accident. If you must take time off work to recover from injuries caused by a forklift accident, you may be entitled to workers’ compensation benefits. These benefits can pay for necessary medical treatments, replace lost wages, and enable you to receive vocational rehabilitation if you are no longer able to perform your job duties. In addition, you may be entitled to permanent disability and catastrophic benefits. Unfortunately, you may have to fight to obtain the benefits you deserve.